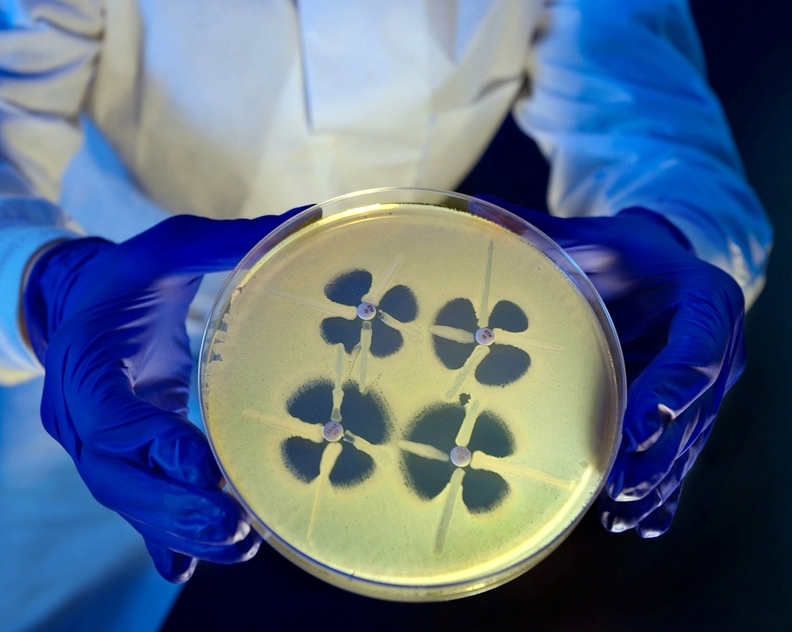 A CDC lab test shows the bacteria Enterobacteriaceae's resistance to carbapenems, considered last-resort antibiotics. Nationwide testing of healthcare facilities in 2017 discovered more than 200 instances of what health officials have dubbed "nightmare bacteria." The bacteria were resistant to most or all antibiotic treatments and had the ability to spread their resistance to other germs. An analysis released Tuesday by the Centers for Disease Control and Prevention found 221 cases of unusual antimicrobial-resistant pathogens in 27 states, mostly in hospitals and nursing facilities where patients were attached to ventilators. Speaking with reporters on Tuesday, CDC Principal Deputy Director Dr. Anne Schuchat said the number of cases found were more than she had expected, but it was also reassuring to know efforts that have been put in place over the last several years to rapidly detect such pathogens seem to be working. "By finding these early when there is just one in a facility we can stop this from becoming very, very common," Schuchat said. Schuchat said addressing the threat of such pathogens required a more aggressive approach that called for healthcare providers and state and local health departments to begin infection control measures in the event of a single case to prevent a possible outbreak. She said the CDC estimates that employing such a strategy could reduce the number of nightmare bacteria cases in a particular area by 76% over three years. "The containment strategy will let us bend the curve or slow the spread of rising resistance," Schuchat said. Germs with unusual antimicrobial-resistance include those that cannot be killed by most or all known antibiotics, are uncommon to a certain geographic region of the country or rare to the U.S., or have genes that allow their resistance to be spread to other types of germs. The first-of-its-kind surveillance was conducted over the first nine months of 2017 through the CDC's Antibiotic Resistance Lab Network, an initiative launched in 2016 to expand the ability of state laboratories to track antimicrobial-resistant threats; the initiative allows healthcare providers to more quickly identify such infections to prevent their spread. More than 5,770 samples were tested for bacteria with unusual resistance. Facilities that were found to have an unusual resistance germ had 1 in 10 patients that did not have symptoms related to their infection, which meant it could have spread undetected. And 1 in 4 germ samples sent to the Lab Network were found to have genes that allowed them to spread their resistance to other germs, according to the study. The samples were initially submitted to public health departments when there was a suspicion of an infection. Antimicrobial resistance has become an increasing concern in recent years as pathogens have evolved and become more difficult to treat. Efforts to develop new types of antibiotics largely came to a halt over the past two decades as drugmakers pursued investments in products with more profitable returns. The CDC estimates more than 2 million Americans contract an antibiotic-resistant infection each year, resulting in 23,000 deaths annually.